The Trincomalee is a Leda-class frigate and one of two surviving from her time – the other is the HMS Unicorn, which is a museum ship in Dundee. The ship was built in Bombay, India by the Wadia shipwright family and is made from teak due to the shortages of oak in Britain. This came about due to the increase in shipbuilding for the Napoleonic Wars. She was named for the 1782 Battle of Trincomalee off what was the Ceylon, now Sri Lanka near the port with the same name. 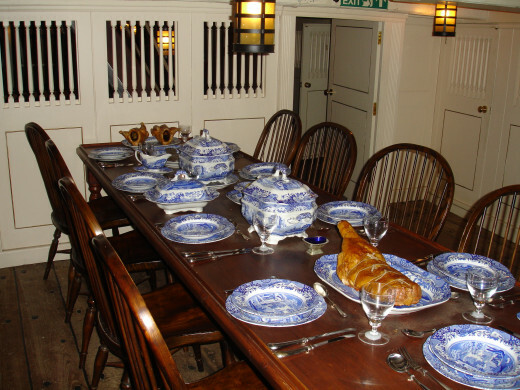 Her launch on 12th October 1817 saw her sail to Portsmouth Dock, arriving in April 1819. She was held in reserve until 1845 when she was rearmed and reclassified as a 6the rated spar-decked corvette. Trincomalee remained in service for ten years, serving on the North American and West Indies station. Her crew helped quell riots in Haiti and stopped an invasion of Cuba as well as working on the anti-slavery patrols. She then joined the Pacific Squadron in 1852 and sailed the western coast of America. She was sold for scrap in 1897 but was purchased by entrepreneur George Wheatley Cobb, who restored her and gave her the name Foudroyant, in honour of HMS Foudroyant, his earlier ship which has been wrecked. She became an accommodation ship alongside HMS Implacable then later as a holiday ship based in Falmouth then in Portsmouth. 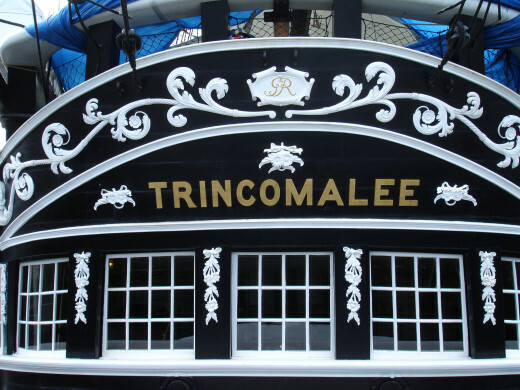 She was in service until 1986 when she was restored back to her original glory and renamed Trincomalee in 1992. 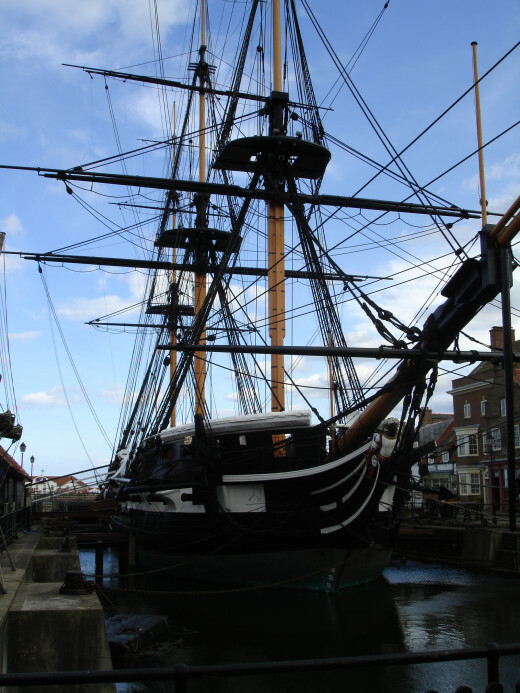 Trincomalee is the oldest warship still afloat, as HMS Victory is older but in dry dock. She is part of the National Historic Fleet, Core Collection. 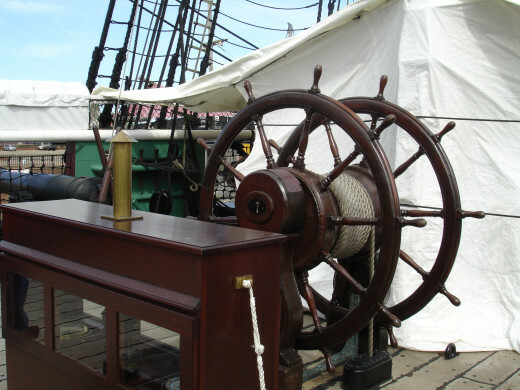 You enter the ship on the Quarter Deck where you will see the Captain’s Wheel which needed two sailors to man it. 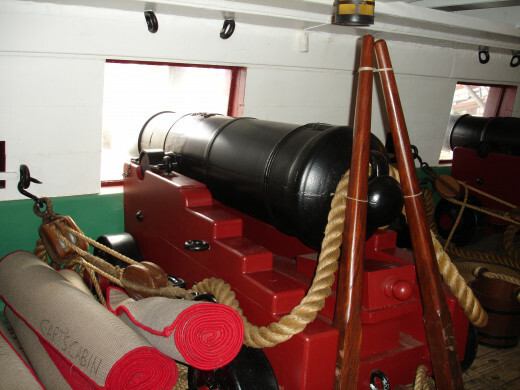 The deck held 18 pounder cannons and 12 pound carronades. Typically, frigates had 28 18 pounders, which were counted as heavy artillery and weighed over 2 tons per cannon. 12 pound carronades were short-range weapons which had a low muzzle velocity and were made by the Carron ironworks. Below this, is the Gun Deck where more of the ships 18 pounder cannons lived. Each cannon needed a crew of several men to load and fire them as it was done by muscle power alone. 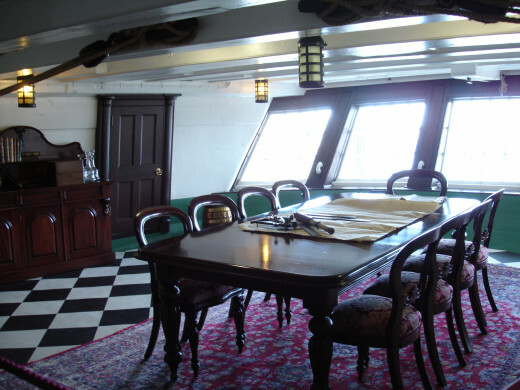 On this deck is also the Captain’s Great Cabin, which took up a huge amount of space in comparison to the rest of the accommodations. Also found here was the Gallery Stove, where most of the meals were prepared and the Manger, where the live animals were kept for milk, eggs and meat. The Mess Deck was the next level of the ship where the crew would sleep and relax when off duty. The wardroom for the officers was at one end while the ordinary sailors had hammocks strung shoulder-to-shoulder with each other. 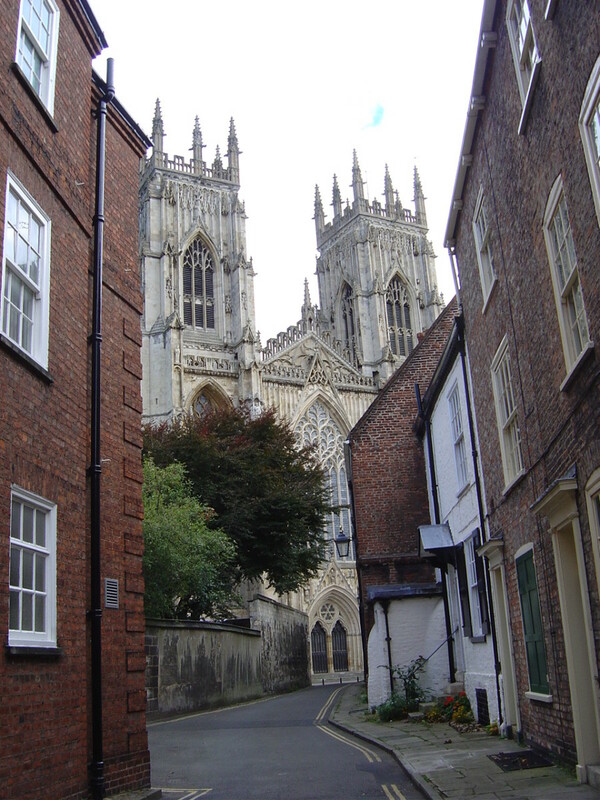 The Royal Marines stationed on the ship also lived here, in their role to stop any thoughts of mutiny. At the base of the ship were the Orlop Deck and the Hold where all provisions were kept as well as the gunpowder for the canons. ‘Powder monkeys’ were young boys, occasionally girls, who passed charges through hatches in the ceiling to the sailors above and their conditions were terrible – it was always nearly dark. There was also a passageway down here for the ship’s carpenter to be able to access damage to the hull below the water line. There is also a small shop on site to buy merchandise relating to the ship including books and prints, as well as a limited amount of small ornaments made from the original teak removed from the ship during renovation. 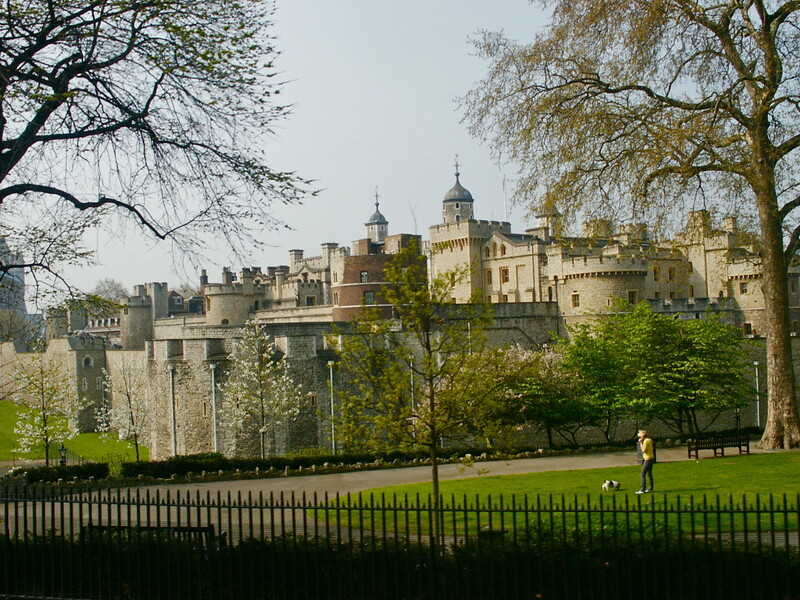 Away from the ship herself, the site offers some other attractions for visitors. The Trincomalee Exhibition has an array of graphic panels showing the history of the ship including video and audio pieces as well as an area documenting the restoration project. A special artefact is the diary of Eliza Bunt, who travelled on the ship’s maiden voyage to Portsmouth. Interpretation in the Ship is another exhibit which uses mannequins to show scenes from the ship, such as the sick bay or the cabins to give a real life glimpse at what conditions were like aboard. How low through the ship would you go? The Classic British Frigate of the Napoleonic Era, fully restored as the oldest vessel of her type to remain afloat. 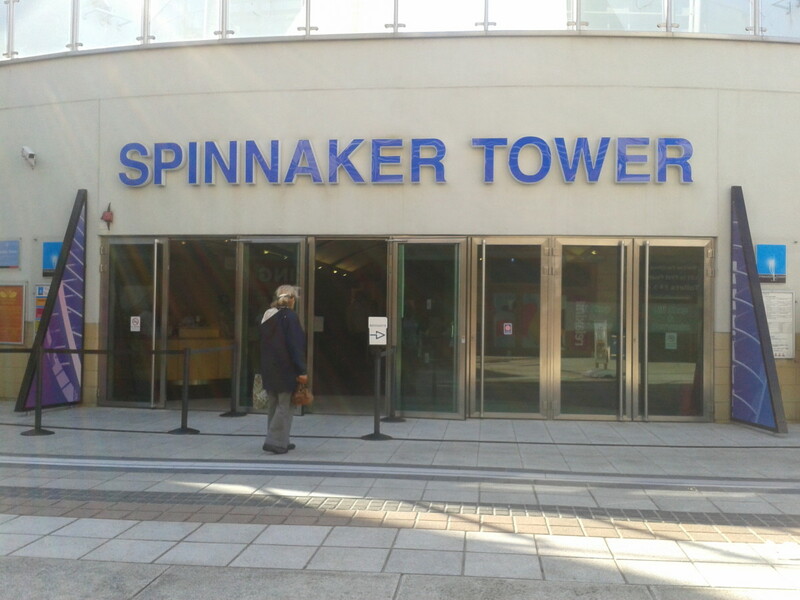 A part of Hartlepool's Maritime Experience.